A good mountain bike not only adds adventure and fun to your life but also aids in weight loss and promoting optimum overall health. Any cycling aficionado can attest to this. Purchasing one of the best mountain bikes is not a walk in the park, though. If anything, there has been a proliferation of bike manufacturers that have stormed the market with units laden with additional features and state-of-the-art technological advancements. It gets a little confusing, especially for first-time buyers. In addition, with all the terminology there is regarding mountain bikes, a bit of in-depth knowledge is required for you to get the best mountain bike. Mountain bikes also come in different variants, each designed to combat a specific set of terrains. 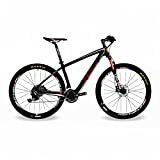 But the environment is not the sole differentiating factor here – the bike’s features and construction should also be considered when choosing the best mountain bikes. Before we get to the best mountain bikes, let’s have a quick look at major factors to consider. 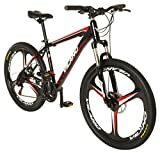 As put above, there are numerous types of mountain bikes in the market; ranging from rigid to front or full suspension, dirt jumping, free ride, downhill, all mountain, singlespeed, and 29er. The prices for these bikes vary just as much as the features. What’s more, their ideal uses are different as well as some of the materials used in their construction. If you are looking for an all-around bike to use on trails and roads, then your best bet is a rigid mountain bike. It is low maintenance and has a comfortable riding position. It is also very efficient and runs smoothly on the flat ground. However, if you are looking for a stable bike with adequate stand-over clearance and sturdy frames, then the dirt jumping mountain bike is the ideal option. Choose the freeride mountain bike for your terrain parks or common travel desires or the downhill option for extreme descents. All in all, ensure that the mountain bike you purchase matches your reason for the purchase. An excellent way to ensure you get the best bike is to do as much homework as possible. A mountain bike might be less pricey compared to an automobile, but it requires the same evaluation before making a purchase. Are you okay with an average-looking yet effective bike or are you the type that only likes high-end products? Do you prefer cutting-edge technology or a simple design? Do you want the bike for a long time say ten years or even more or do you want to upgrade it as you develop your riding skills? Aside from these considerations, you should also give some thought to the amount you are willing to part with, for the mountain bike. Prices vary regarding features, brands, as well as models. Do not forget to include biking accessories such as gloves, helmets, cycling shorts, and shoes to your overall budget. The frame material is another vital factor to consider when shopping for mountain bikes. Mountain bikes are made from either aluminum, titanium, carbon fiber, steel, or a mixture of any of these materials. Seeing that all materials vary regarding characteristics, comfort, weight, the prices of the bikes are also different. It is advisable to buy a mountain bike with a frame material mostly used by manufacturers, such as aluminum or carbon-fiber. Aluminium is favored by a majority of manufacturers because it can make both stiff and light bikes. The next best material is carbon fiber, which is neither cheap nor provides better suspension compared to aluminum. Butting can be conducted on your aluminum frame to add more strength to your bike. On the other hand, very little can be done about carbon fiber mountain bikes, which sometimes may crack under pressure. Still, Carbon fiber is the best material for professional mountain bikers seeing it has an outstanding stiffness-to-weight ratio. Steel is also a conventional material for entry-level mountain bikes seeing it is cheaper and stronger. On the other hand, there are very few titanium-made mountain bikes because this material is costly. On the flip-side, such bikes are lighter and offer more durability compared to those made using any of the materials above. Different manufacturers provide varying components when it comes to mountain bikes. Pioneers in the mountain bike industry such as Merax, BEIOU, BMX, and Raleigh offer varying components depending on your level of riding and bike brand. Such components include double or even triple chainring cranksets as well as customized pedals. Over the past few years, there have been significant improvements in mountain bike braking systems. But even with that, there are two primary brake designs; namely, rim and disc. The former is also referred to as V-brake, direct pull, or linear pull while the latter comprises of mechanical and hydraulic discs. Rim brakes might be a traditional design but are simple to repair, weigh less, and are effective. But considering that they stop the bike by rubbing against the rims, these brakes are known to wear rims off gradually. They are also not as effective in wet or muddy areas. As such, most manufacturers opt for disc brakes, especially when manufacturing off-road mountain bikes, which gives them a braking system similar to most cars. Hydraulic discs are especially vital seeing as they improve braking, reliability, and modulation. Mountain bike wheels are protected by well-pressurized tires, which help prevent any damage to the rims. And so, before choosing a bike, be sure to factor in your weight, terrain, and your riding technique, to ensure your wheels serve you longer. Also, ensure that the treads on the tires are designed for the terrain your bike is most likely to frequent. Some mountain bikes also have tubeless tires, which come in handy when avoiding pinch flats. Tubeless tires also hit corners better due to improved traction, and offer riders more control. Aside from these features, ensure that the mountain bike you purchase has good handlebars, pedals, and a padded seat for comfortable rides. Having said all that, here are some of the best mountain bikes on the market for your consideration after our detailed evaluation. BEIOU has been in the mountain bike industry for quite a while, and their products have kept growing in reputation and efficiency. The Carbon Fiber 650B is an exceptional example of this high quality and fantastic performance. This bike has a wheel size of 27.5/29 inches, which is the ideal size for most off-road mountain bikes. Besides, considering that the Carbon Fiber 650B’s frame is primarily made of carbon fiber, its strength and rigidity are all relatively improved. As such, this bike is safe for use by both kids and adults as well. The Carbon Fiber 650B also weighs around 11kgs and comes with accessories such as multi-tools pedals and hidden disc brakes. While the pedals might be the M248 from WELLGO, the saddle is designed by BIEOU. However, the Carbon Fiber 650B is also a bit pricey. Nonetheless, considering its features and materials used, it’s an excellent choice for beginners. The Diamondback Overdrive 29 Hardtail Mountain Bike might cost less than the Carbon Fiber 650B, but it is equally impressive when it comes down to the bike’s performance and features spec’s sheet. As far as the general outlook goes, the Diamondback Overdrive has a simple Hardtail design and is available in a number of colors including black, white and red. This bike is perfect for trail riding thanks to its 29-inch wheels and ideal control. The large diameter of the wheels helps riders role over big holes easily while giving them better control and sufficient traction. It is made from 6061-T6 aluminum alloy, which covers the frame and butted tubes, adding to its rigidity. Nonetheless, the aluminum frame ensures that this mountain bike is not only strong but also light in case carrying it is required. The Diamondback Overdrive also uses Tektro disc brakes for its braking system and comes in a variety of sizes. Its design might not be as alluring as some of the bikes on this list, but its features make it a decent mountain bike. Just like its counterpart above, the Talus 2 Mountain Bike is available in a variety of different sizes ranging from small to medium, large, and extra-large. It’s also cheaper and has a more straightforward design and fewer features. It is just as effective and is a significant addition to Raleigh’s entry-level mountain bike series for cross country, nonetheless. If you are looking for a bike to use daily on gravel or dirt trails, then the Talus 2 Mountain Bike is your best bet. Some of its features include a 27.5-inch SR Contour suspension fork for smoother rides and same-sized wheels with 2-inch tires for improved efficiency. As far as gear shifters are concerned, the Talus 2 Mountain Bike offers 21 gears to choose from thanks to Shimano. It is worth noting that a few past buyers have complained that the bike needs derailleur adjustments at the front. Still, the Talus 2 Mountain Bike can be assembled in a short period. But if you are not confident of assembling the bike, take it to a local bike shop. It is also unfortunate that despite having a warranty, Raleigh does not accept responsibility for damages caused during assembly. Sizing: xs=5'-5'3", s=5'3"-5'6", m=5'6"-5'9", l=5'9"-6', xl=6'-6'4"
The Merax Finiss might be in the same price range as the Talus 2 but its design is by far the most elegant. Besides, its wheels are made from lightweight magnesium alloy for smooth transportation and rides. The Merax Finiss also has an aluminum handlebar and pedals and can shift up to 21 gears. Shimano makes most of its components including the brake levers, front and rear derailleurs, and the shifters. The Merax Finiss uses mechanical discs for braking, which are more efficient than rim brakes. Upon shipping, the bike is 85% assembled with only the handlebar, tires (pressure), and the pedals remaining. The pedals are also labeled, and each is designed to fit its specific side, whether right or left. The Merax Finiss comes in different alluring colors and is among the most durable mountain bikes on this list. Nevertheless, it is ideal for entry-level riders. The El Oso Grande is the perfect off-road fat tire mountain bike. This bike is available in a variety of sizes starting from extra small to small, medium, large, and extra-large. The bike arrives 85% assembled. As such, minimal installation of parts is required as well as adjusting some components to guarantee a smooth ride. Despite being big, the El Oso Grande Fat Mountain Bike is surprisingly fast and nimble. Perfect for trail adventures, this mountain bike has large tires, which come in handy when enhancing suspension and a smoother ride over potholes. Not to mention, the El Oso Grande Fat Mountain Bike has hydroformed aluminum tubes and gears that can serve any terrain. This bike also uses disc brakes for proper stopping and modulation. The best thing about the El Oso Grande Fat Mountain Bike is perhaps its 5-inch tires, which dig into any terrain providing excellent traction. 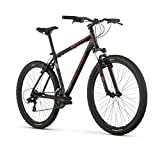 The Vilano 26-Inch Frame Mountain Bike is yet another bicycle with an astounding design that comes in black and red. This bike is made mostly from aluminum, which guarantees longevity and helps cut its weight for comfortable ferrying, if needed. The Vilano 26-Inch Frame Mountain Bike also comes with custom alloy wheels and a suspension lock with a lockout. This bike is intended for fun from its design to its 26-inch alloy wheels, which provide amazing traction. It also has mechanical disc brakes, which aid sudden and proper stopping as well as up to 21 gear changes. All-purpose tires Shimano shifters help make this entry-level mountain bike an ideal choice for beginners. Even better, its price is surprisingly low for a mountain bike with such features. As you can see, a mountain bike is only as practical (and useful) as its intended purpose. It makes no sense to purchase a costly bike with features only found in pro-athlete bikes if you’ll only use it around your house or for a quick run every now and then. The best approach would be to kick off your biking romance with an entry-level unit then upgrade to more complex models as you hone your handling prowess and dare to venture into uncharted terrains. 3rd eye is a trusted review and recommendation website specially designed for those who are looking for reliable bike related products and services. Our primary goal is to help you make the best and most efficient purchasing decision for your needs. 3rd-eye.com is a participant in the Amazon Services LLC Associates Program, an affiliate advertising program designed to provide a means for sites to earn advertising fees by advertising and linking to amazon.com. 2017 3rd-eye.com. All rights reserved.